Hello and welcome to this page on my website which is all about my photography taken in the Borough of Poole. At the time of writing this I am a Poole resident and it is nice to be able to post a set of pictures about the place I currently reside. Which makes me a local photographer ideal to help you with your photography requirement in Poole as well of course. I have posted a selection of 12 images, as I do for all my web pages, which reflect what Poole means to me. There are lots of pictures of the sea, which is no great surprise. If you need any photographs taking in Poole, or indeed anywhere else in Dorset, please get in touch with me either by email, telephone or from my contact page. I’m always delighted to hear from new people in the Borough of Poole and I respond to everyone who takes the time and trouble to get in touch with me. If you are after a specific picture of Poole give me a shout - I have thousands of images in my Lightroom Catalogue so might have just the picture of Poole you are looking for. That's enough about me – I am going to write a little bit about the 12 images which I have included on this page of my website. Please note that the order in which I describe the images is in date sequence of image capture, starting with the oldest picture and finishing with the newest picture. I do change the sequencing of the images from time to time so the images might be in a different order to the text but I am sure you will be able to work it out. This picture was taken with my good old Canon 5D and Canon 24-105mm lens. This is a single image capture, taken with an exposure of 1/20th second at F18 with an ISO of 50. What makes this picture for me is the lovely glowing light of the setting sun, which is reflected off the fronts of the beach huts. The eye is drawn to the two bright spots in the image, the setting sun and the golden light on the doors of the huts. This is exactly the effect I was hoping to achieve. There is a small amount of light just hitting the ground giving it something a bit more than just plain blackness. Beach Huts make great subject matter for those classical English seaside scenes – I like this picture because of the time of day it was taken giving a different view of the Hamworthy Beach Huts. I love long exposures. My Canon 6D, and the Canon 5D used for this picture, are both great at capturing long exposures in low light with minimal noise. Its those lovely high quality full frame sensors that are part of how these DSLRs perform such miracles. This is another single image, captured using an exposure of 40 seconds with an aperture of F22 and an ISO of 100. I would have used by Lee Big Stopper neutral density for this picture to get such a long exposure in not so dark conditions as this. This is a personal piece of work so I am fine with the magenta hue to the lighting. Long exposures can cause problems with the white balance of an image, which is something that needs correcting in Lightroom as white balance is the starting point for correct colour. This jetty is not far from Rockley Park and Poole Harbour Canoe Club. This picture was taken, believe it or not, with a Canon Powershot G11. I had forgotten about this camera until I found this and a picture on my Bournemouth Photographer web page (the funicular one). I was processing this image in Lightroom, extracting out all the colour and detail I could from one of those famous Brownsea Island Peacocks, completely unaware that I did not use a DSLR. If ever there was a lesson to not worry about camera gear too much this is it. This camera has been completely replaced by my iPhone, but is still capable of producing results like this. Brownsea Island is looked after by the National Trust. You can get to the island from boats in Poole Quay and also from the Sandbanks side of the chain ferry. This picture was taken with my Canon 50D and Canon 70-200mm lens using a focal length of 165mm. Using the Canon 50D which has a cropped sensor the 165 mm focal length is multiplied by what is called the crop factor of 1.6, giving an actual focal length of 264mm. The exposure was 1/640th second at F8 using an ISO of 400. The story of this image is the Britanny Ferries MV Contention leaving the Port of Poole on its way out to sea, sailing towards Millionaires Row in Sandbanks and the rising sun off to the east. The MV Cotentin is a freight only vessel which provided a regular service from Poole to Cherbourg before being withdrawn from service. Another picture taken with my Canon 50D taking advantage of the APS sensor with its crop factor of 1.6, making the focal length used of 191mm actually 305.6mm (to be precise). Shutter speed was 1/1600th second for a very good reason – I took this picture of Sandbanks from the top of an access platform which was used to survey Poole Police Station roof. Whilst up on this platform I took advantage of the views on offer, including this picture of the famous houses on Banks Road, also known as Millionaires Row. These houses have sea views to both the front and backs of the properties – very unusual. And very cool! The high shutter speed was to counter the movement of the MEWP (Mobile elevated work platform) to which I was securely fastened just in case (and not my shaking bones honest). The fast shutter speed combined with my excellent Canon 70-200mm F4L lens worked well to give me a nice sharp image. I like this composition, with the shape formed by the placing of the boats moored in Poole Harbour. Everyone sees this scene from ground level – I was fortunate enough to have this view from over 100 feet above ground level. When you are on an access platform taking photographs you have to make the most of the opportunity. I was looking down on Poole Stadium from more than 100 feet above ground level, looking the other way from the view towards Sandbanks. As Poole Stadium was so close to the platform I switched from my Canon 50D with 70-200mm lens to my Canon 5D with 24-105mm lens. Yes I was slinging two cameras whilst up on this platform to cover all eventualities, packing focal lengths from 24mm all the way to 320mm. I like this unusual view of Poole Stadium and the land surrounding it. As it was such a dull day I have given the colours in the picture a bit of a boost to give the image some punch and pop. 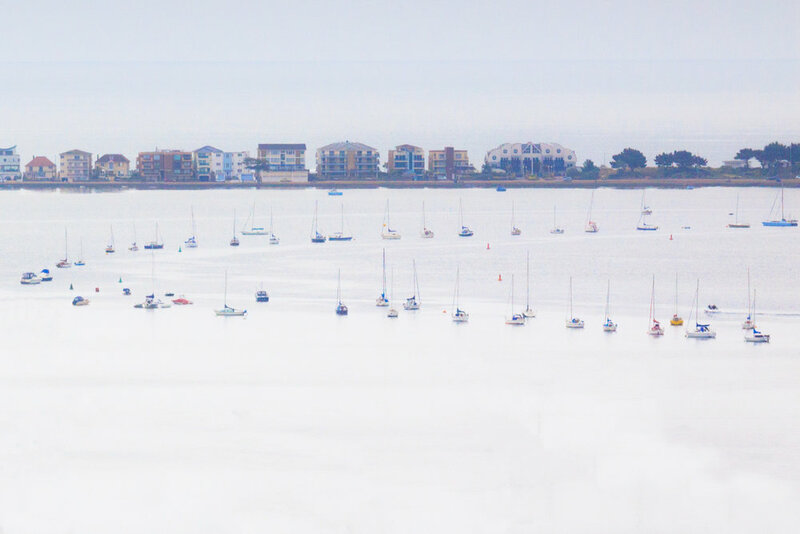 Yes these are technical photography terms…..
Now this is one of my favourite pictures of Poole. This picture was taken at Fisherman’s Dock at the bottom end of Poole Quay looking towards Sandbanks one January morning. This picture is a single image capture on my Canon 5D with Canon 17-40mm lens at the wide end of the focal range, 17mm. The exposure was 1/125th second at F8 with an ISO of 640. I love the morning colours in this sunrise image, with the range of reds, pinks, oranges, yellows and blues. The reflection off the flat water adds nicely to the effect. This picture is exactly why you can often see me out and about somewhere ein Poole at sunrise with my camera in hand. This is a wonderful memorial to those who have lost their lives selflessly for others. I am going to extract the following text from the RNLI website, which you can access here. “Designed to be a beacon of hope, the RNLI Memorial honours the courage of all those lost at sea while endeavouring to save the lives of others. Many brave and selfless lifeboat crew and search and rescue service people are remembered proudly in their local communities. However, the RNLI Memorial sculpture in Poole, Dorset, UK, is the only place where each and every one of them is named together. The memorial was unveiled in 2009 and serves as a source of inspiration for current and future generations of lifeboat crew, lifeguards, supporters and fundraisers. It reminds us that there are still people who volunteer to carry out selfless acts of heroism to help others; and we will always remember their sacrifice. In most cases, the names listed on the memorial saved the lives of others before losing their own. See the full list of names. You can add your tribute to the people named on the memorial, and to all the RNLI’s lifesavers, past, present and future. 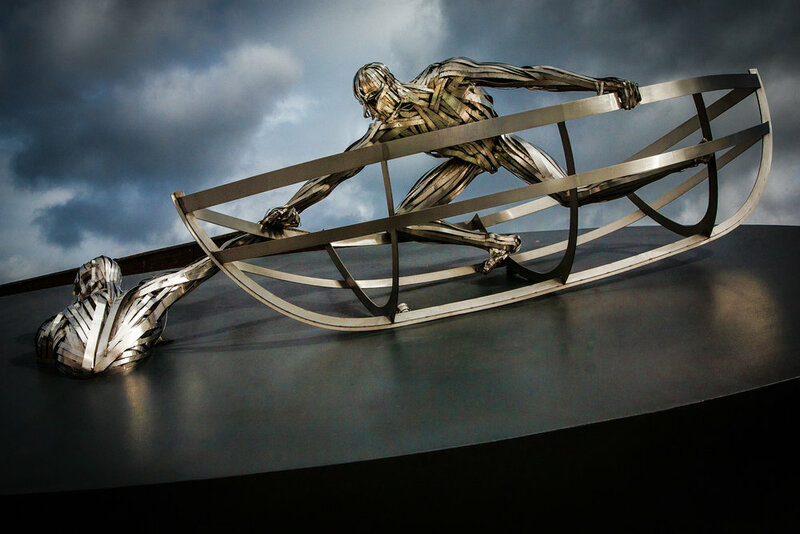 Sam Holland’s sculpture, depicting a person in a boat saving another from the water, symbolises the history and future of the RNLI in its most basic and humanitarian form. Sam intended her design to be bold and simple, incorporating the elements of courage, loss and remembrance. Above the list of names of those who sacrificed their own lives to save others, the sculpture bears the motto of Sir William Hillary: 'With courage, nothing is impossible.' It’s a beacon of hope, honouring those who continue to save lives at sea, as well as those lost in the act of lifesaving. These are not my words. These are the words of the RNLI. A different angle. A different point of view. I like different points of view. You might have noticed this. The Twin Sails Bridge is a recent addition to the skyline of Poole. The stylish new bridge was opened in 2012, and has provided a vital additional transport link from Hamworthy, Upton and beyond into Poole Town centre. It has also allowed for the old Poole Lifting Bridge to be closed for major engineering works. The bridge has various lift times between 5.30am and 11.30pm, as well as unscheduled lifts for commercial vessels longer than 40m. The Twin Sails Bridge provides excellent photographic opportunities, but for this page of my website I have gone for a low level shot showing the bridge almost closed. This picture was taken with my Canon 6D with a 17mm focal length on my Canon 17-40mm lens, handheld, as I wait for the bridge to open to let me on my way. I drive out of my way to get caught with bridge lifts – I know but this is the stuff that I love to photograph. This is not a long exposure – this is a series of short images merged together to provide a single image. I have taken three pictures, one after the other. The first picture is the correct exposure, the second image is 2 stops underexposed, capturing the details in the shadows, and the third exposure is 2 stops overexposed, getting all those highlights. By putting these images together I can create an HDR image – that is an image with more dynamic range than a single image can record. This is something I have been practising for some years now, which enables me to capture images with a different look and feel. My technique is so refined now I am able to concentrate on what I am actually taking a photograph of rather than the technical aspects of photography, which is great for my composition and image capture. 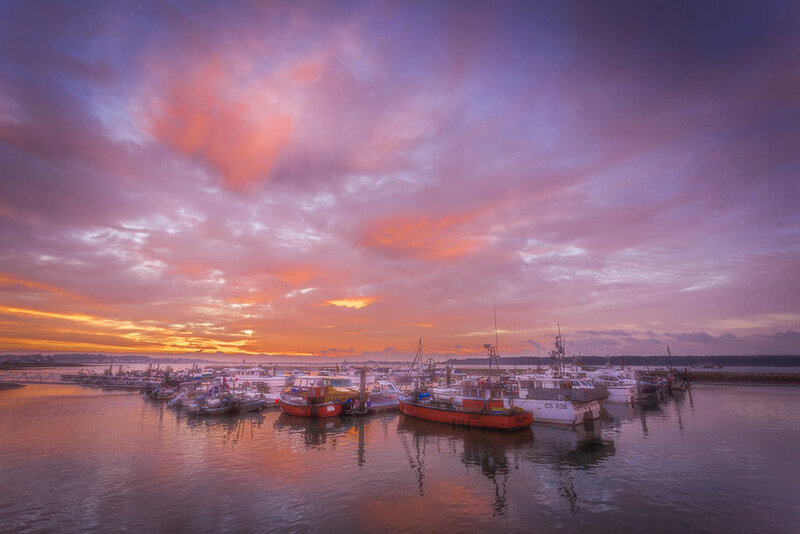 And this picture of the Port of Poole at sunrise is a great example of this technique in action. This is a stylish picture, even if I do say so myself, of some boats moored near Poole Quay. This is a single image taken just as the sun is rising over in the direction of Sandbanks. Taken on my Canon 6D and Canon 17-40mm lens on my Manfrotto Tripod. I know that this picture was taken on my tripod as the exposure was a full 30 seconds, with an aperture of F16 and an ISO of 100. Please do get I touch whatever your photography query in Poole – I would be delighted to hear from you.